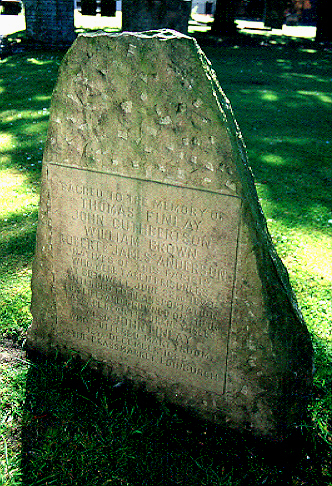 The memorial to the Deerness Martyrs is located on the north side of the Laigh Kirk (now known as the New Laigh Kirk) in the surrounding graveyard. The church is located in the centre of the town, with access to the graveyard from John Dickie Street. 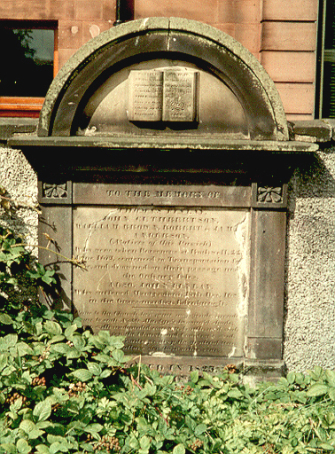 The stone shown above is a replacement for that shown to the right, which was unfortunately removed when the wall around the kirkyard was rebuilt. A small sandstone memorial commemorates the Kilmarnock Covenanters who were captured at the Battle of Bothwell Bridge and sentenced to transportation. The were shipwrecked off the Orkney coast and drowned.